The DefenderShield Cell Phone EMF Radiation Protection SlimFlip Case for iPhone 8 / 7 Plus is a unique and pioneering EMF protection solution that provides ultimate safety while using your cell phone. Backed by FCC certified lab testing, DefenderShield technology blocks up to virtually 100% of iPhone EMF radiation from 0-10 GHz emitted by the front of your iPhone 8 / 7 Plus without affecting signal quality. How Does the DefenderShield SlimFlip Case for iPhone 8 / 7 Plus Work? The state-of-the-art, patent pending DefenderShield technology uses multiple layers highly advanced shielding materials that work in unison to block, divert and absorb unsafe levels of cell phone radiation emissions. When using your iPhone, just keep the flip cover closed to block cell phone radiation. By keeping the cover closed while against any part of your body, a barrier is created to protect from a broad spectrum of potentially harmful cell phone radiation emissions. Why the DefenderShield SlimFlip Case for iPhone 8 / 7 Plus? 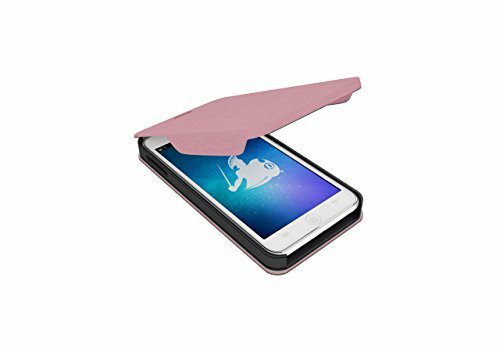 The handcrafted DefenderShield Case offers protection from cell phone radiation while providing stylish protection with a soft microfiber interior and elegant faux leather exterior resistive to scratching, staining and the accidental drop. TOTAL PROTECTION IPHONE RADIATION - Only iPhone radiation case that uses multiple layers of shielding to block up to virtually 100% of All iPhone EMF Radiation from the front of your phone. This case will NOT affect signal quality. Most cases only block a fraction of 1-2 of the 3 existing sources of EMF radiation that are being emitted from your phone. We use multiple layers of shielding to block ALL radiation sources at nearly 100% so that you are FULLY PROTECTED! PROUDLY MADE IN THE USA -> We do not have our EMF shields shipped in from China or other countries! DefenderShield is a family owned and operated company who makes our antiradiation products 100% in the USA. When you purchase a DefenderShield anti-radiation product, you help to support the US economy. DefenderShield - The Worldwide Leader in EMF Protection and Shielding!